Within the KRIN project – Creation of a Regional Innovation Network, the second, joint meeting of sector boards of metal and wood processing industries was held. 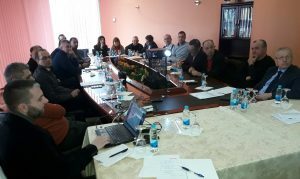 The meeting was attended by representatives of the RS Ministry of Industry, Energy and Mining, the RS Ministry of Science and Technology, the Faculty of Mechanical Engineering of the University of Banja Luka, the Chamber of Commerce of Republika Srpska, the Wood Cluster Banja Luka and directors of companies from metal and wood processing industries. At the meeting findings of conducted research on innovations in metal and wood processing industries were presented. It was discussed about problems with labour force that companies are facing with, as well as about ways in which situation in this area can be improved. A working version of the database containing available capacities of enterprises was presented and the first feedback information were received which will be used for its improvement. Content and time schedule of study visits and trainings which are planned within the further project activities were also discussed.